Feel bird-brained when you first wake up? Eat a high protein breakfast with this cute winged companion. Feel bird-brained when you first wake up in the morning? A good breakfast helps, especially when adorable winged companions with eggs in their heads are on hand. Their spindly legs, long tails, and beaks are so goofy-looking that even pre-caffeinated, you can't help but smile. 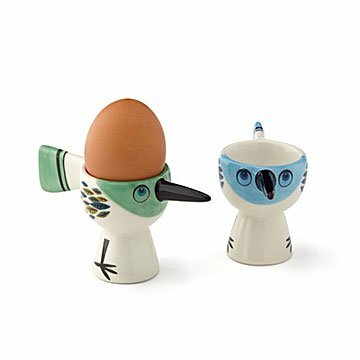 Handmade from high-fired earthenware ceramic, they'll bring a song to the heart of bird-lovers, brunch-givers, and those who'd appreciate a bit of whimsy to start off the day. Choose blue or green. Handmade in Sri Lanka. 13" x 5" x 8.5"